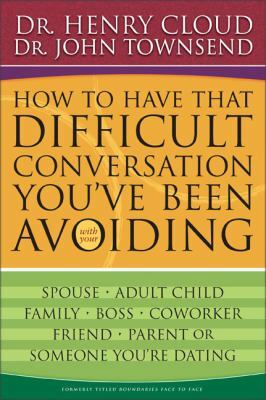 This practical handbook shows readers how to have that difficult conversation they've been avoiding. The text shows how healthy confrontation can improve relationships, and shows how to tell people what you want, stop bad behaviour and deal with counterattack.Cloud, Henry is the author of 'How to Have That Difficult Conversation You've Been Avoiding With Your Spouse, Adult Child, Family, Boss. Coworker, Friend, Parent, Someone You're Dating', published 2005 under ISBN 9780310267140 and ISBN 0310267145.